Not being particularly well versed on Georgian potatoes, I had assumed the Oxnoble to be named after some kind of valiant bullock. Clearly, this made more sense when it was explained to us that we were sitting in Potato wharf… ‘but of course’. Inside, the Oxnoble feels like a ‘proper pub’. There’s a log fire, there’s woods beams, there’s tinsel (?) and there’s also a really warm, convivial atmosphere. Generally lovely. Alex, the manager gave us a brief history on ‘Potato wharf’ and the prominence of that particular spud being sold just over the road, back in the day (1804). It was interesting to hear his vision and how he’s keen to remain true to the pubs roots whilst also offering food that’s a little different (I see you, Pan fried wigeon breast). Also important to the pubs ethos is the ability to source local produce, to which the chef has a pretty free rein, I like that kind of freedom, always have. 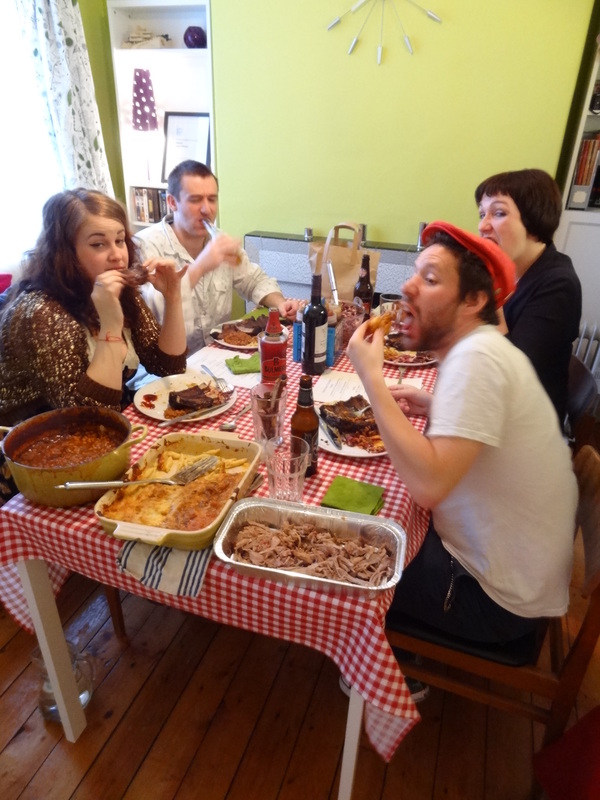 Alex encouraged us to give genuine feedback on our experience of the meal and so we began…. 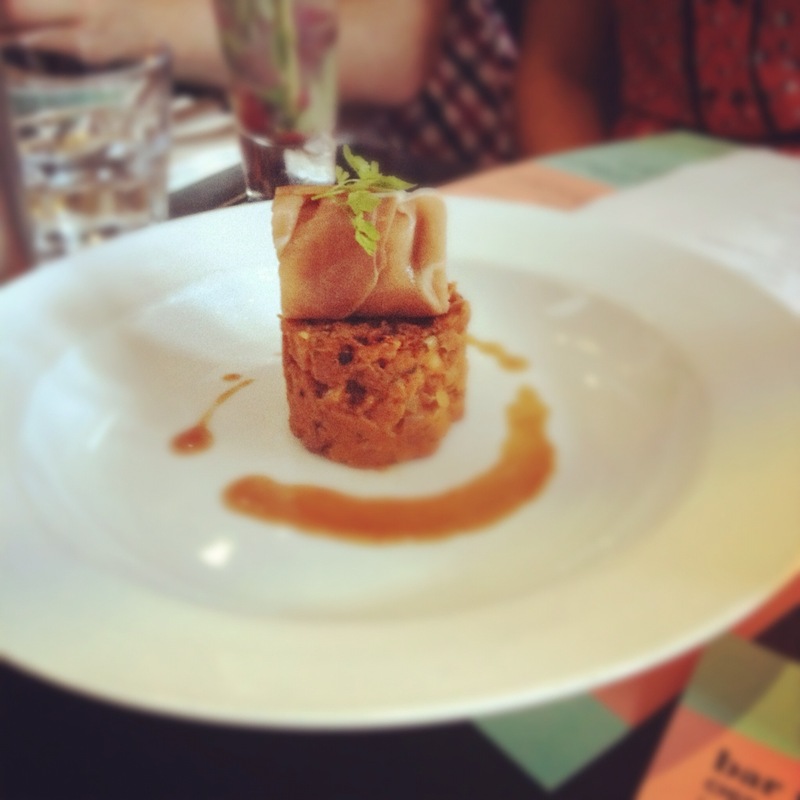 For the starter we began with a Ham Hock Terrine served with curried chutney. This wouldn’t be something I would normally choose, and infact I didn’t, Nina did. I tried it though, rich, curried, cold. I’m sure well cooked, but not my thing. The Pan fried wigeon was pretty damn lovely, though the fact I’ve been unable to get the phrase ‘the cat amongst the Wigeons’ into this review in a clever way feels like a failing. I don’t know how many of you have tried Widgeon before but it’s a little duck, a dabbling duck. To be fair, I chose this dish as it seemed an unlikely starter, but also because it was served with black pudding mash, chocolate red cabbage and green beans and it sounded like it had sass. True enough it was a small bundle of full on flavour and nice to try something I’d not encountered before. Success. I’d just like to stop at this point to acknowledge my confusion over the two menu’s which seemed a little disparate in terms of price point and produce. Whilst I like the philosophy that most people could eat here, I’m not sure if one menu is to the others detriment? The two for £10 (which I think is bloody good value) just feels like a completely different offering than say the Braised venison. Not an issue for me enjoying my meal but potentially making it harder to truly promote whilst it’s being all things to all people. Anyway, on to the mains..
Never one to shy away from too much meat, I went for the chicken. Nicely cooked, but what stood out was the parmesan and sweetcorn souffle..I know, I know but really, it was light and cheesy with a touch of the sweetcorn cutting through. I have to say that the courgette fritters were disappointing. Not might I add, due to how they were cooked but more to do with the accompanying creme fraiche and sweet chill sauce drowning the crunch and becoming a little cloying. Nina and I were split on this one however I was pretty excited to have another terrine that wasn’t made of ham, and found the cherry kirsch to be a nice sour counterpart to the richness of the chocolate. In summary, despite my turmoil over the double menu the Oxnoble is a cracking pub that I would happily eat in again. I like that there’s not a pub like this on every street corner, I like that the chef’s classically trained and I really like that it serves beautifully cooked food without a hint of pretension. I expect that it continues to be popular, because it’s easy to support a pub like this. Although not hidden away, finding such a place in the city centre which doesn’t feel like the space it inhabits can sometimes be pretty damn precious. I can’t bloody stand Tequila. It’s a cheap, nasty tasting alcohol requiring lime and salt to keep it down. So thank God someone invented a top flight Tequil trail to show me the error of my ways. The Liquorists are a team of liquor and cocktail aficionados operating from their base at 22 Redbank. This is where the Tequila trail started, however its not where mine really started. An accident on the Mancunian Way saw me arrive late to 22 Redbank 40 minutes late. I had just enough time to grab a tube of nachos before the taxis arrived to take us off on the trail. The concept for the evening was simple, 5 tequilas, 5 cocktails, 5 locations and at each one, an insightful description of the history and process behind the drink. Having missed 1/5 of the evening, I was keen to make up time on the trail. From the map above you can see our trail. We began our trip at Apotheca with a shot of Don Julio Reposado. Being aged for only a short period it was light and sweet but with a stronger flavour than I’d expect for a ‘young’ Tequila. 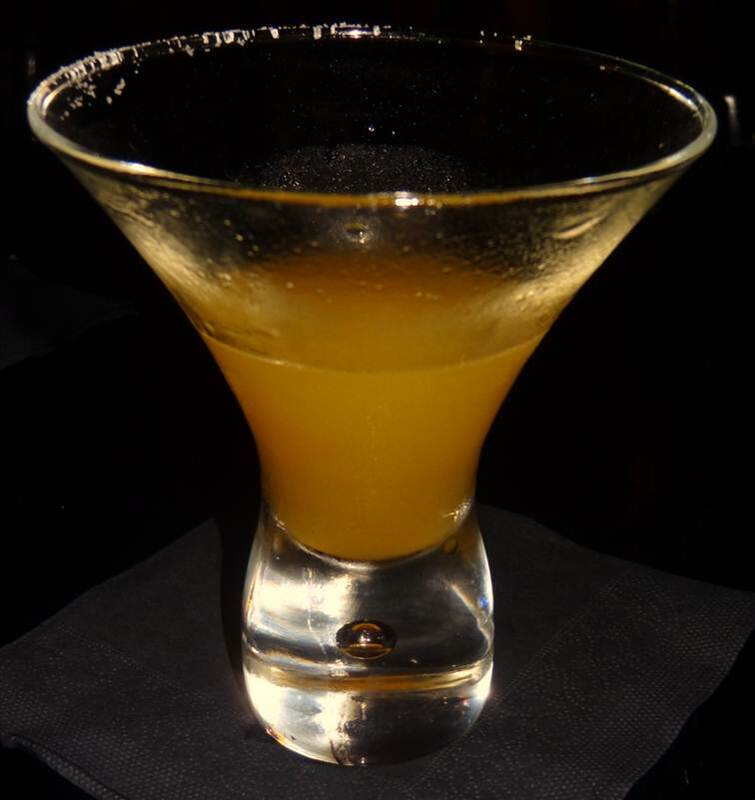 The cocktail made from this Tequila was a Mango and Rosemary Margerita. The sweetness of the cocktail meant the tequila flavour blended seamlessly making this cocktail easy to drink. Almost a little too easy. Thank goodness for the Liquorists ‘No Hangover Guarantee’. Before I could ask for another round of these great cocktails, we were of to the next stop on our trail. 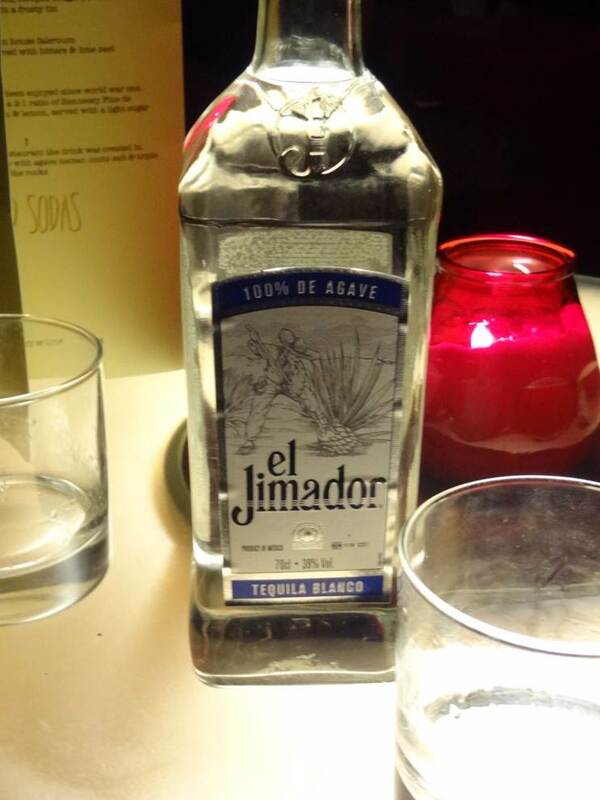 Socio Rehab was our next stop and our Tequila was El Jimador Blanco. As an unaged Tequila it had a clearer, more distinctly spicy scent to it and had none of the mellowing that the aging process offers. Even so, it’s still easily drinkable on its own as a spirit. The cocktail we were presented with for this spirit was the Paloma cocktail. This cocktail is grapefruit based and was made with Ting. If you’ve not come across Ting, check out the wiki here. It’s a Jamaican grapefruit juice drink, giving this cocktail a delicious tanginess to go with that spicy Blanco tequila. Two drinks to go and we had to walk a full 3 minutes across to Stevenson Square and down the stairs into Hula Tiki Lounge. Here is where we took in a different ‘presentation’ of cocktail. 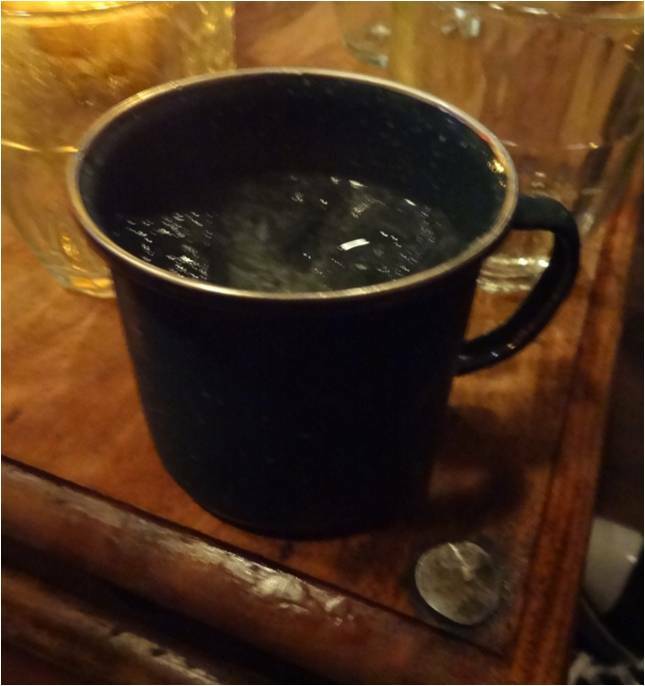 This is certainly the first time I’ve ever been issued a cocktail in a mug. This Tommys Margarita was mixed using Casa Herradura Plata and a simple mix of agave syrup and lime. This was my personal favourite of the evening, having the warm tequila spice mixed in with the cooling flavour of the agave syrup to temper it. Margarita in a mug. Just the way mum used to serve it. 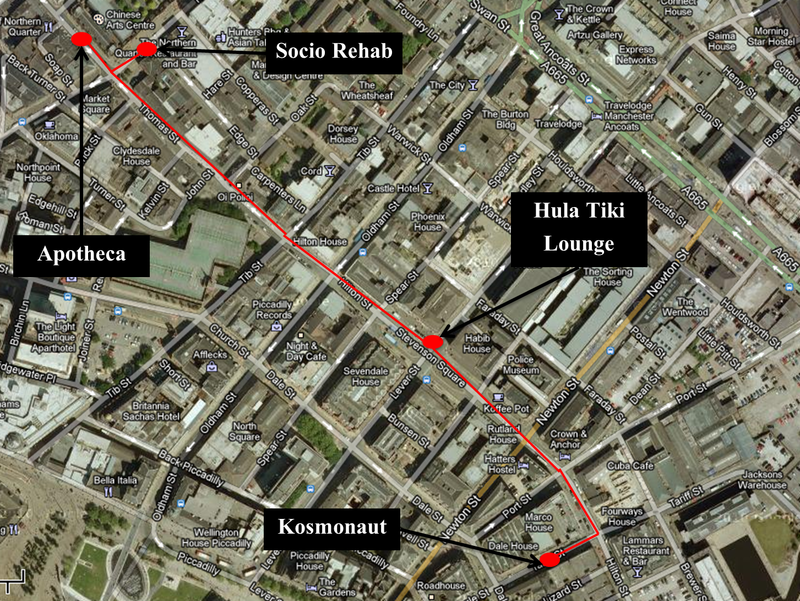 We wrapped up the evening in Kosmonaut, one of the latest bars to pop up on the fringes of the Northern Quarter. To be quite honest, by this point I was that engaged in the conversation with the rest of ‘the Trailers’ and having not eaten enough before we set of, that I didn’t really take in much about the last tequila and cocktail. I do remember that it was made with Tabatio Anejo Blanco tequila, as I was wise enough to get a shot of the bottle. I also remember particularly enjoying the cocktail as it was go very quickly. The rest however escapes me. This is why I’m a blogger and not a journalist: attention to detail. As the trail came to an end and people began to dissipate I headed home, musing on the events of the evening (I didn’t really muse on anything but it’s important to say that I did in order to make the narrative of this section flow and draw this review to a neat conclusion). 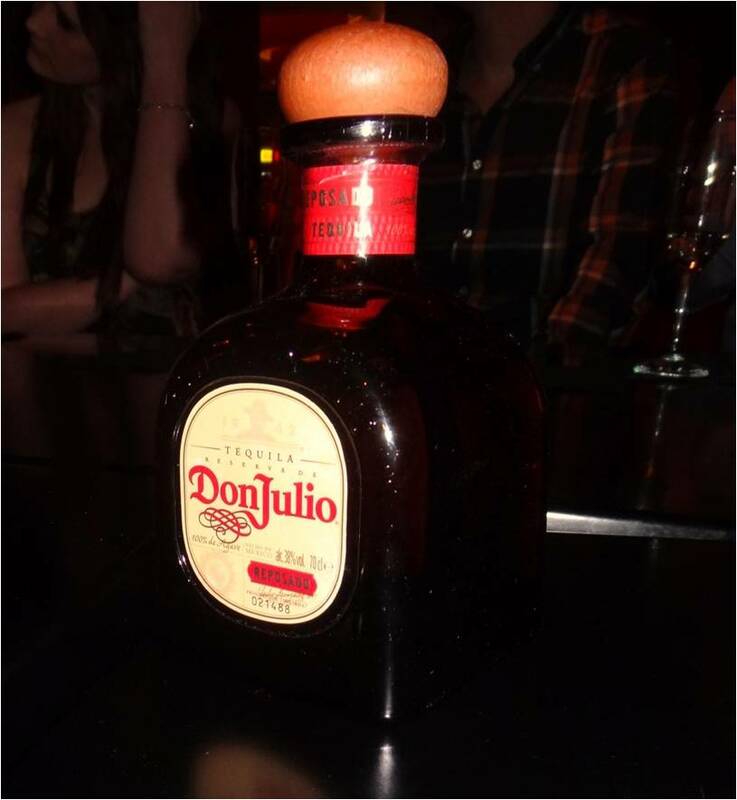 I recall musing on whether the evening had changed my view of Tequila? Would I now drink the stuff? Yes. Would I order it in a bar? Yes. Would I order it over my regular spirits of rum or whiskey? I’m not too sure. The important thing to remember is that if you want your world view of spirits changed forever, or if you just want a series of stunningly sublime and sippable cocktails, you need to speak to the Liquorists. You’ll be in good and knowledgeable company. Arriving at Thomas Restaurant and bar I was a little flustered and nervous, especially given that I have never attended a food blogging event. When I first spotted this place on Thomas St in the Northern Quarter, I had to admit it looked ever so slightly incongruous, compared to some of the other establishments on Thomas St. It just looks, I don’t know, slicker than some of its neighbours. Inside, despite it being a rather gloomy Wednesday afternoon, the restaurant’s got a light and airy feel with high ceilings. It’s a good-looking joint and perhaps it was the French wine but the inside space felt almost ‘tardis’ like with a mezzanine floor and open kitchen. The bar and seated dining area are on the ground floor and the first floor features more open dining space, the kitchen and an outdoor terrace. Finally on the second floor, there is the Clubroom. This room’s a cosy and comfortable spot for all manner of music, drinking and bonding with friends. There’s even some talk of jazz nights coming soon. When asked what cocktail I would like (you had me at ‘hello’ Thomas people) I saw the words ‘Joan Collins’ on the menu and couldn’t resist. I didn’t take a picture of it because I was too busy enjoying its majesty. A long, refreshing, summery (yes, I know) cocktail with Gin, lemon, grapes and tonic. Classy but satisfying. For starters we were presented with Crab Cakes, Potted Smoked Duck Breast and Warm Goats cheese & Onion Tart. I’ve always had a hard time picking favourites as I am an indiscriminate lover of all things food. However, given that crab cakes are one of the few things I tend to avoid (so easy to get wrong) these were rather lovely. Comforting yet elegant and well complemented by the lime and mango; my mind may have been changed. The Potted duck was rather nice to look at, and equally as enjoyable to eat, though I do feel like there can never be enough Chorizo salsa in the world. Finally the Goats Cheese & Onion Tart was a firm favourite around the table. *Did someone call it a cheesecake? * It was like that in the savoury sense of the word. 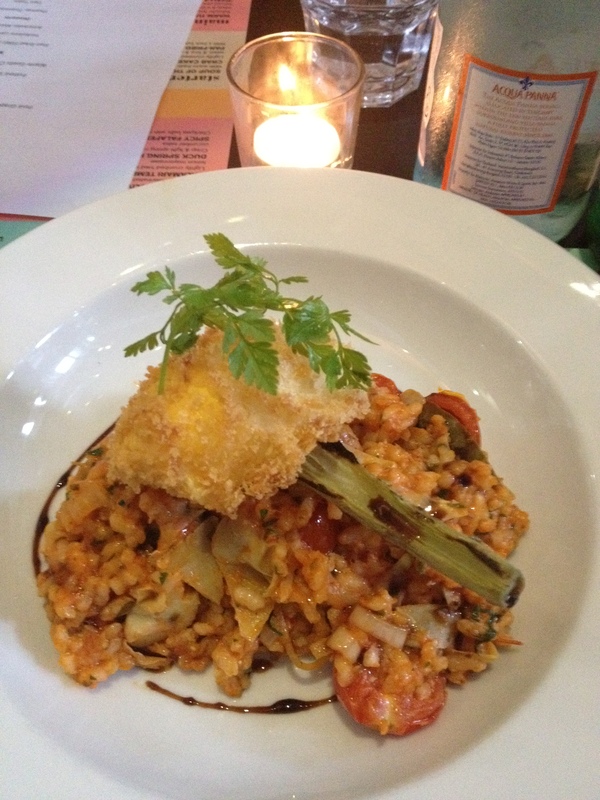 For the mains we shared Pan fried Fillet of Whitby Plaice, Yorkshire Lamb Shank and Artichoke risotto. The Plaice was subtle and no doubt expertly cooked, I have to say that I tend to favour something with a richer flavour therefore the Yorkshire lamb shank was more my taste. This was a serious piece of meat and the Savoy cabbage and Pancetta combo hidden under the lamb was a nice counterpoint. Though, erring on the heavy side I would say that this would be a dinner time main. I had at this point become ‘Meat drunk’ and stopped taking nice Instagram pictures and decided to go for the ‘Money shot’. The artichoke risotto with a crumbed duck egg yolk was blinding. This was so..good. The egg actually oozed and the risotto was very rich and flavoursome. 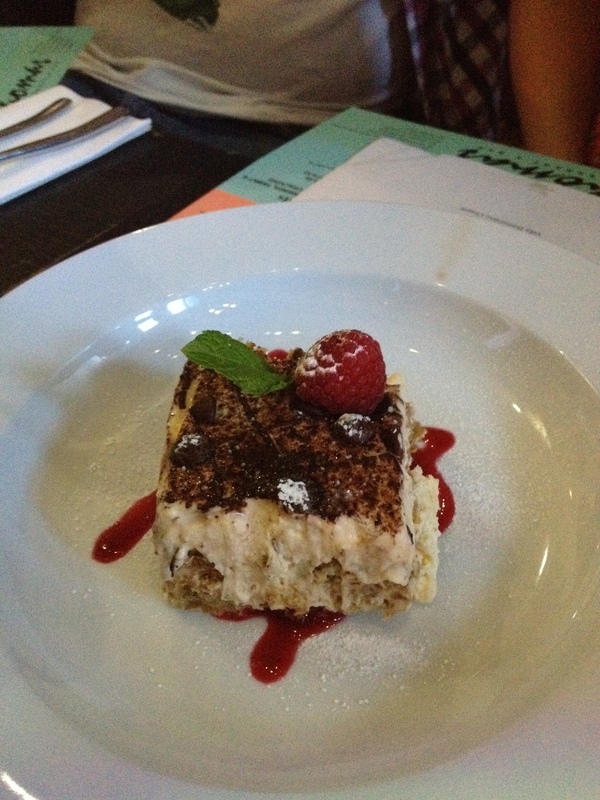 So, then it came to dessert…typically this is where some people start to lose pace, but not I. 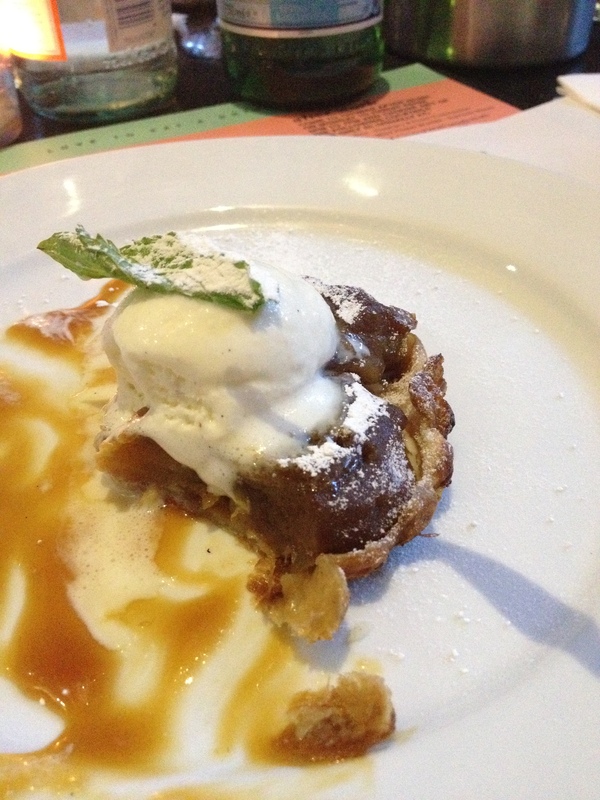 The picture of the Tart Tatin below demonstrates this, I’m like a wrecking ball. If I were forced to choose a favourite dessert (which is an infrequent occurrence in my day-to-day) it would have to be the Tart Tatin, but followed incredibly closely by the Thomas Tiramisu and Lemon tart. Before I forget about the wine.. I do love me a good Viognier, aromatic, floral, apricot-y?…The Aimery Viognier we drank was no different. Also, the Macon Villages was rather special. Refined, floral, with good structure, and a nice acidity. Basically, good eatin’ wine. I didn’t try to food match with the wine, I drank it and enjoyed it. Finally, I think a shout out (is that even appropriate?) should go out to the waiting staff who were charming and efficient and of course a warm thank you to Nicky and Yvonne for being such good hosts. 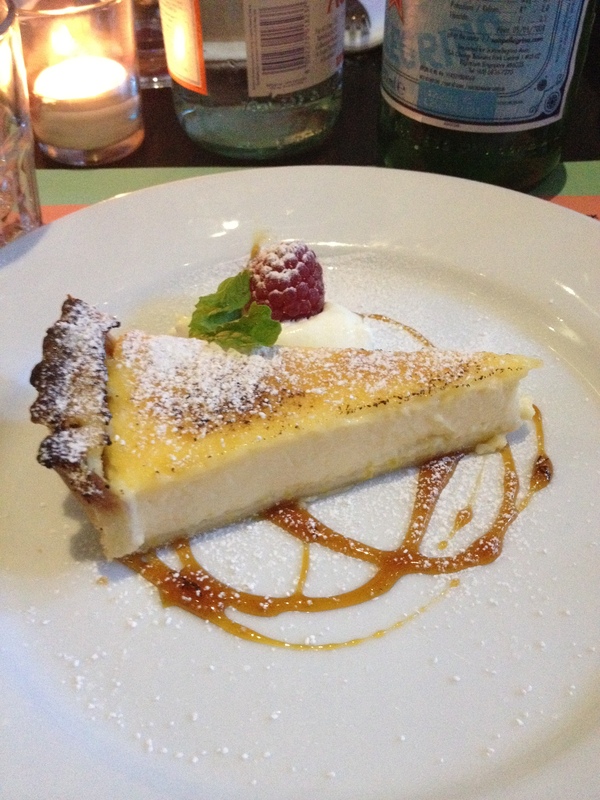 So to wrap it up, a really lovely evening and some really good eating. Nice also to get out of the house and meet some of the Manchester foodie community. NB I’d like to point out that I was invited to a free evening before the opening of the restaurant and did not pay for my food and drink, however I have still written an independent review. 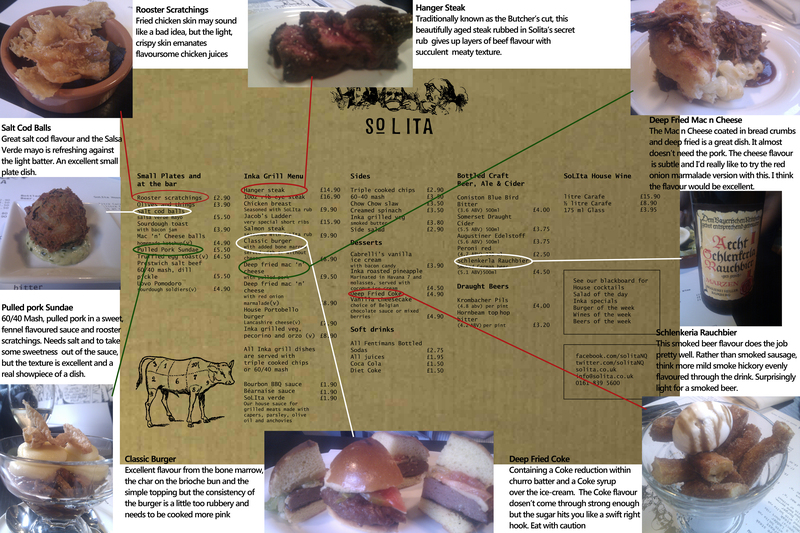 If you’re looking for reviews of Solita, there are plenty to choose from. Given their expert courting of the restaurant reviewing and food blogging communities of Manchester, they’ve managed to get the kind of press coverage typically reserved for a small-scale city-council scandal. I must admit, I liked the place. The food was really good quality, the staff were friendly and despite the fact that the target dempographic came off a bit as being ‘All things to all men’, there was a clear vibe to the place that said that great food was the first and foremost focus. So everything you need to know about this menu has already been blogged. Hungry Hoss gave the place a fair and thorough menu review (though I’m fairly sure he’s been adopted as the unofficial mascot of Solita judging by the Twitter feed), Things To Do in Manchester confessed to a new-found Bacon Jam addiction thanks to the menu and Andrew Stevenson made no bones about the areas for improvements, as well as praising some of its ingenuity. So what am I bringing to the metaphorical table then. Well, the place mats of course. Allow me to explain. One of the points that stood out to me in this stylish red leather and black wood bar was that the place mats on the table were also the menus. Seemed at odds with the slick look, but it worked, but the thing that it was missing were some descriptions of the items. You don’t want to have to break out your smartphone at the table and pull up a blog to find out what the Pulled pork sundae or the salt cod balls are all about do you? Of course not! So I’ve made a new menu. This one gives you a bit of a heads up about the dishes. It’s a menu and a restaruant review, or for those of you who like a good portmanteau (two or more words bashed together to make one new word) its a ‘Revmenu’ of a ‘Restremenu’. Just print out a copy and take it with you. 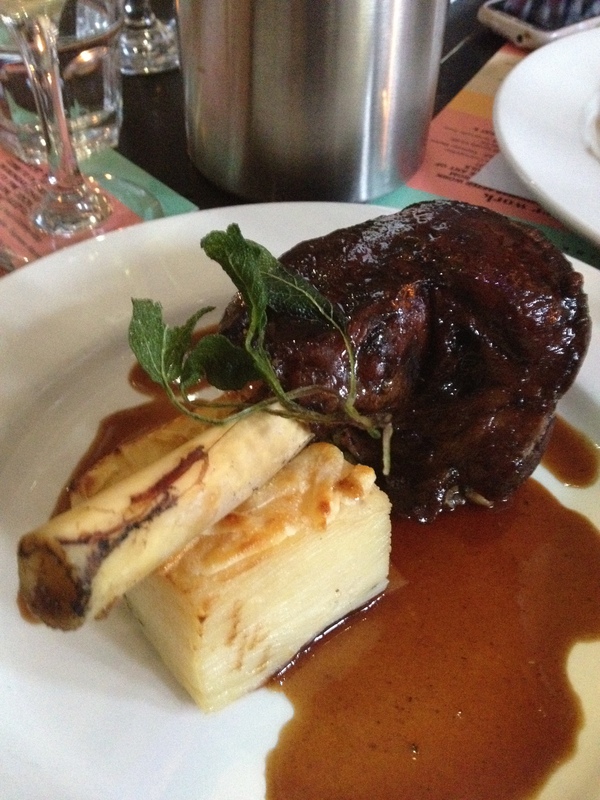 You’re guarunteed to be considered a sophisticated, ‘in the know’ sort of diner. If anyone does take a printed copy of this with you, please, please, please send me a photo.An entire review condensed into a menu sized print out. 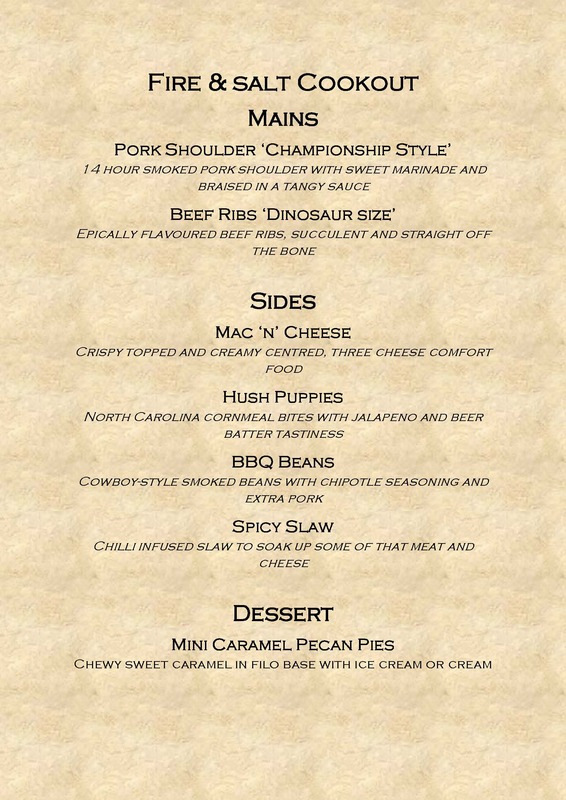 Your new A3 placemat menu, just print off and take with you. What more could you want? Now run along you cheeky scamp and grab yourself a Pulled Pork sundae and some Salt Cod Balls. 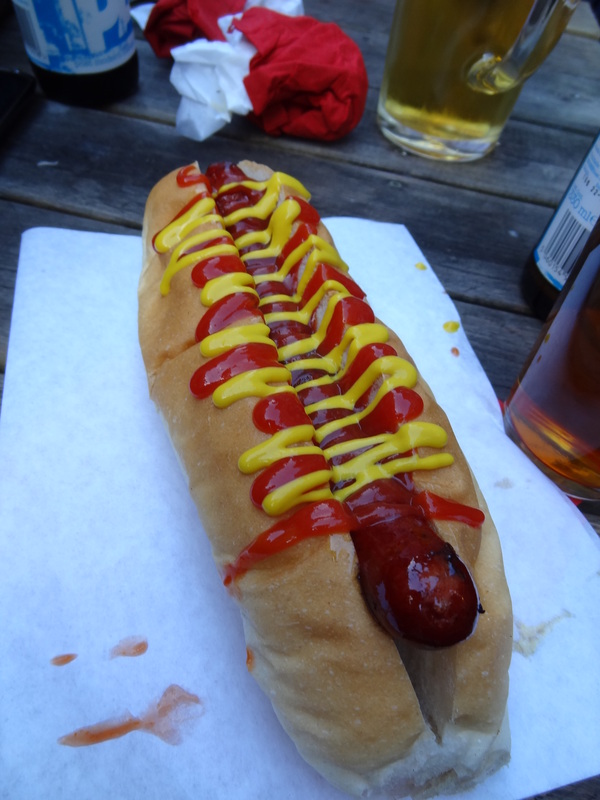 Drunk nights out normally might end with a big greasy hot dog smothered in ketchup and mustard, but for this evening I decided to start with one. Port Street Beer House were playing host to Dirty Dogs. 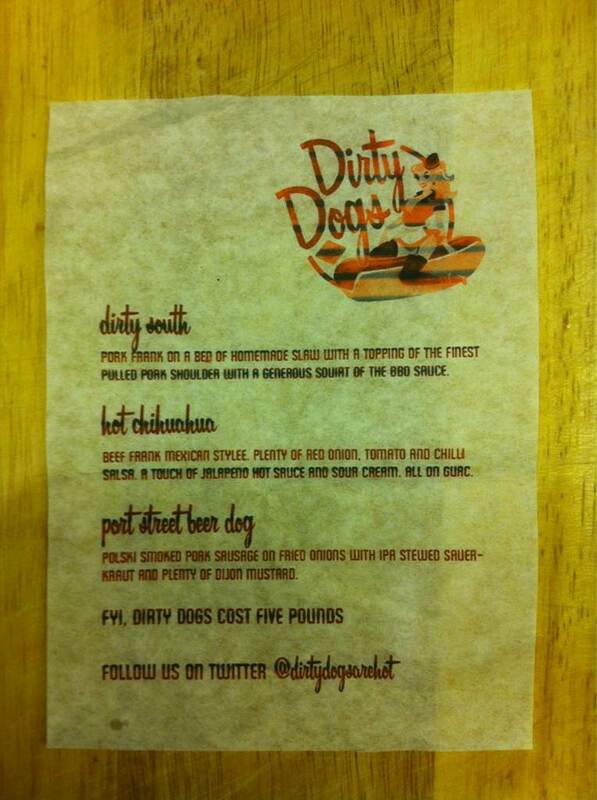 Getting away from tinned hot dogs, Dirty Dogs were offering a trio of quality dogs. The three hot dogs on offer were a smoked pork sausage, a beef frank and a pork frank. Walking in the front door, I could already smell the hot dogs and onions from the grill so followed my nose out into the beer garden. What I hadn’t counted on was a queue. Not really knowing that there was big demand for these dogs, I queued patiently only to find that by the time I got to the front, they had run out of toppings. This was either poor planning or a testament to the popularity of these dogs. So what did I end up with? I got the Beef frank without the toppings, but in their place I was given a mustard/ketchup lattice. The beef frank was great; good bite and salty flavour, but I really wanted to give those toppings a try. I was assured however by North West Nosh, who had thought to have one put aside for her, that they were great. I’ll just have to take her word on that one until I can track these Dirty Dogs down again and try the full thing for myself. There are some strong opinions in Yorkshire about how a Yorkshire pudding should be made. Having said that there are generally strong opinions in Yorkshire on anything you care to ask a Yorkshireman about, but in this case they are justified. The consistency and shape of a Yorkshire pudding should be thick batter and quite flat. 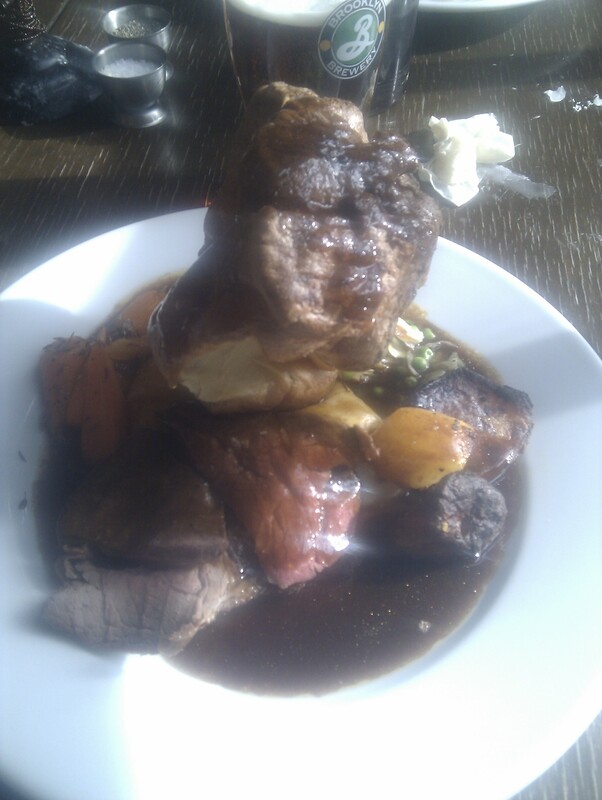 This is because it was traditionally served with gravy as a starter. It was designed to be a filling dish to compensate for a lack of meat in your main course. Today however, meat is plentiful and Yorkshire pudding are light and are sometimes made to resemble a mushroom cloud explosion on a South Pacific island. At least that’s the case at the Parlour in Chorlton. Rated for having one of the best Sunday lunches in Britain by the Observer Food Monthly awards, the quality of every ingredient is expertly prepared. The Roast beef, provided by Chorlton’s own W. H. Frost (my favourite butcher) was cooked pink on the outside, browned on the out, but most importantly, the thinly sliced meat was moist and delicate. This was almost to the point at which it didn’t need the gravy, though I was glad it was there. Rich beef flavour and an even consistency coated the whole plate in a delicious, well prepared gravy. Going back to the Yorkshire pudding though, I’m a purist and while the crisp, mega-pudding is eye-catching and tasty, I want the thick, chewy homemade style ones. So does that mean I didn’t enjoy the meal? Of course it doesn’t, Id be back there in a flash, but this is just proof that even with top quality ingredients and great cooking, you can’t please all of the people, all of the time. This may sound like a negative end to this review but do believe me when I say, no matter how strong your opinions of Yorkshire pudding configuration, this is a lunch worthy of your Sunday afternoon. Fine, this is a piece of shameless self promotion. Since the Observer Food Monthly aren’t kicking down my door yet to write any articles about my food, I’ll just have to write it up myself. Now I can’t really be looked to to give an objective view of my own food, which is awesome by the way, so this is mostly going to be photo based. 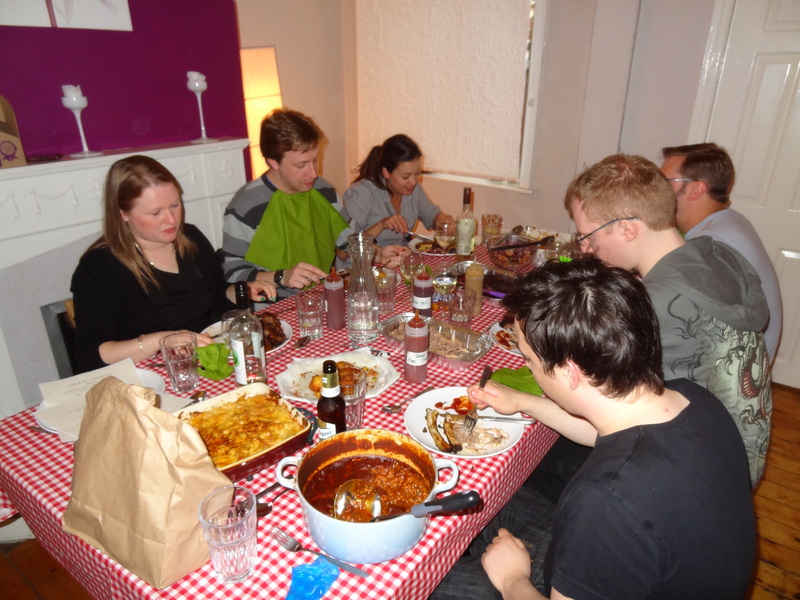 The people were great, the food was delicious and the night was a brilliant experience for me and for the diners. So here’s how it all went. After a day and a half of prep, with the house not just the food, we were ready to host a few guests. 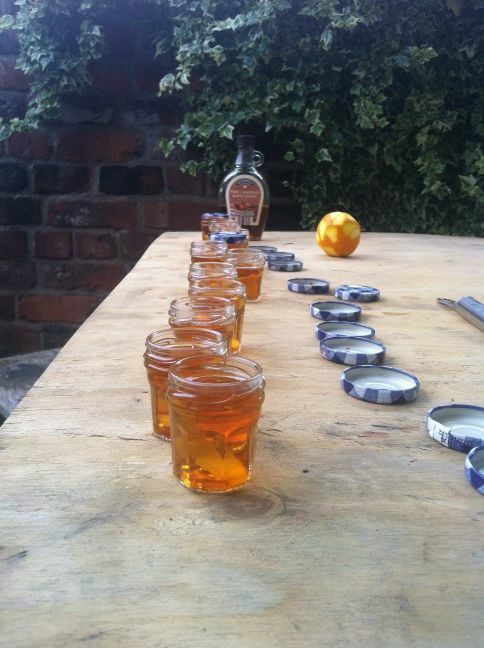 To start everyone off we put out a taster of our pork infused bourbon. With a twist of orange peel and some maple syrup for sweetness, these were a real hit, even if one person did accidentally swallow the orange peel. So how did all of this barbecue delight go down? Here are the pictures. 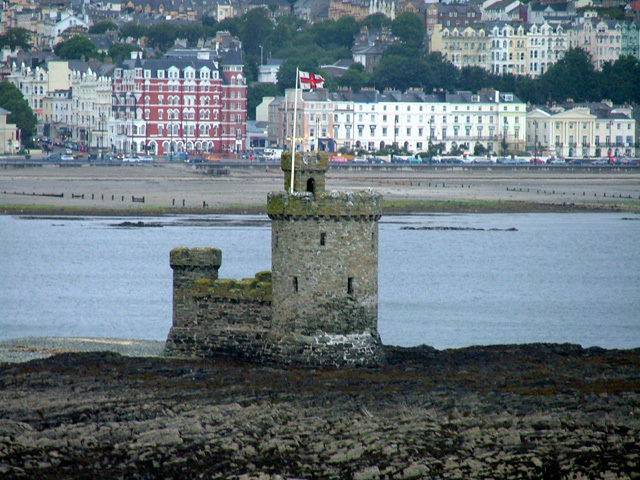 Within Douglas bay in the Isle of Man is St. Mary’s Isle or the ‘Tower of Refuge’. Built as a refuge for shipwrecked sailors in 1832, it was commissioned by Sir William Hillary, founder of the Royal National Lifeboat Institute. Looking out at this seemingly submerging keep in the bay, you may ask why the architect designed it to look like a castle but you may equally well ask ‘Why would you stop there if you’re that close to the shore?’ The same could be said about finding a great meal on the promenade at Douglas. So why would you stop here when just five minutes down the harbour you can find 14 North. The entrance to this little restaurant was a welcome sight to escape from the summer rain as we arrived. Led up the small staircase to the first floor dining room, the restaurant had a cosy intimacy that puts you at ease quickly, making it a more relaxing meal. Diving straight into the menu I began eyeing up some good-looking dishes and because it was a business trip, this meal was going to be a bit of a feast. 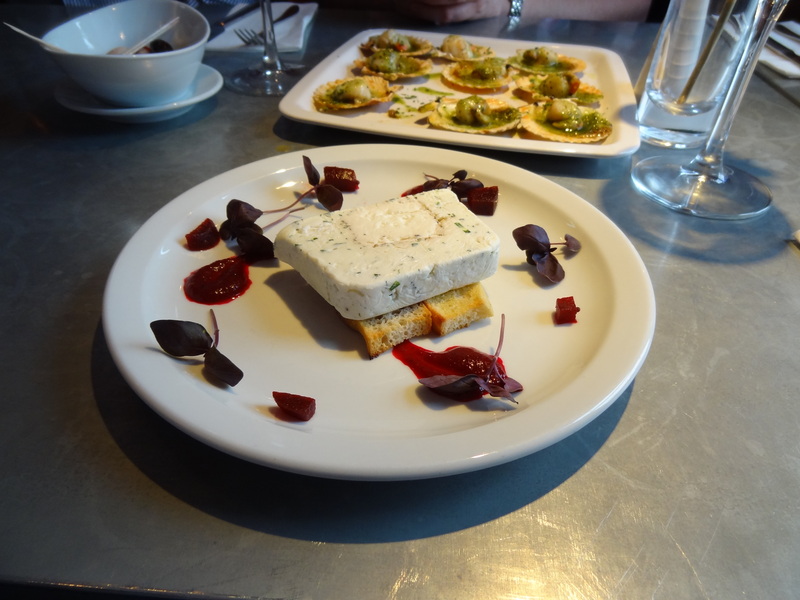 For the starter, I opted for the Goats cheese terrine. The cheese itself was flavoursome, with a creamy textured flavour. The beetroot puree added sharper overtones to the creamy cheese flavour and was topped with the flavour of the pickled beetroot. The sharp beetroot flavour giving way to the smooth cheese meant each mouthful left you wanting that tanginess from the next bite. Moreish stuff. Along side our starters, we were presented with a plate of queenies. 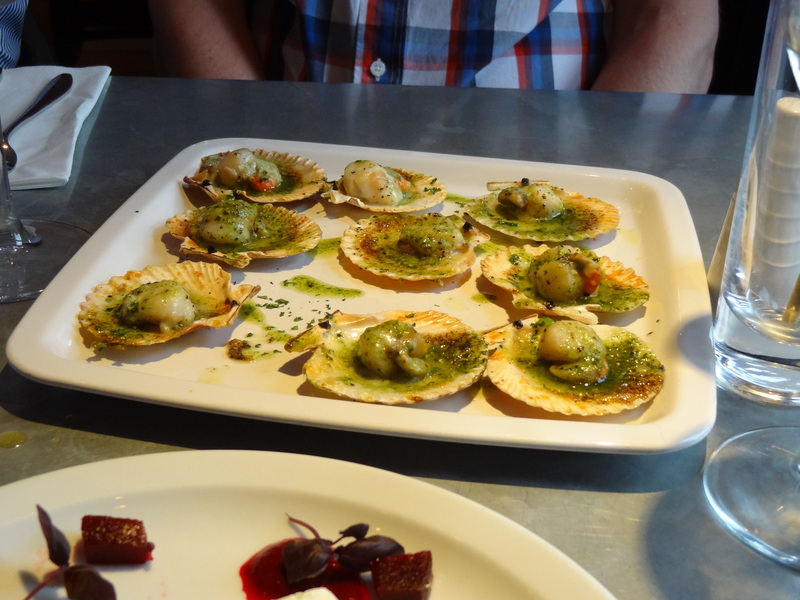 A bit of a delicacy from the waters of the Isle of Man, this plate of Queen scallops were exceptional. Served up in a garlic butter and pesto sauce, the clean seafood flavour of the scallop shone through in what was an amazing example of fine scallops. 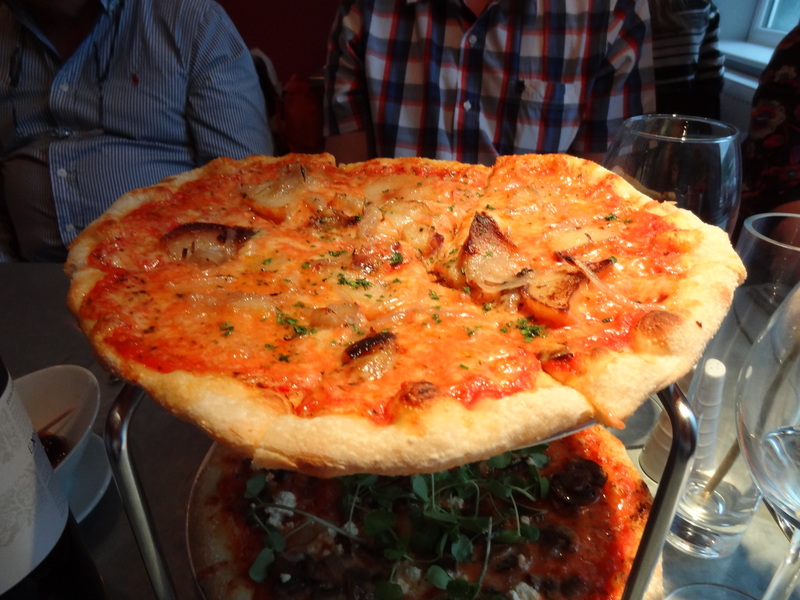 Before moving onto our main course, we tried out some of the flatbreads. The original mozzarella flatbread was well made and had a deliciously firm dough base, but the winner out of the two that we ordered was the Smoked cheddar flatbread. Smokey, tangy cheddar atop tomato and mozzarella with red onions and sauteed potatoes. Sauteed potatoes were a small stroke of genius, adding a chunky bite to the smoked cheese flavour. Too rich to eat in quantity, but just right between courses with its convolution of flavours. I’d describe it is a high-end comfort food dish. For mains, the roasted hake grabbed my eye. Served on a bacon mash with green beans and a mustard cream sauce. 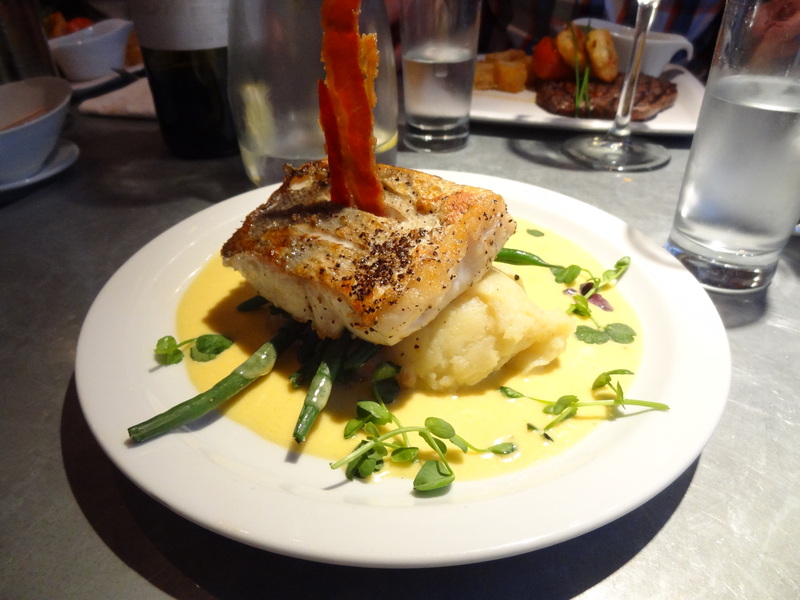 My personal favourite aspect of this dish was the rasher of bacon, cooked crispy and protruding from the hake. Even when having a sophisticated meal with colleagues, a big piece of bacon still makes me smile more than it should. The hake still stood up for itself though. Beautifully cooked to ensure the meatiness in each bite did not prevent the fish from flaking evenly and in full pieces. The roasting kept the fish moist meaning it was great too with the bacon mash. The mustard sauce was creamy, spicy and combined with the mash made a flavourful mix of salt and mustard spice. The sauce almost overpowered the fish but it all managed to hold together with the green beans to make a well-balanced and warming dish. 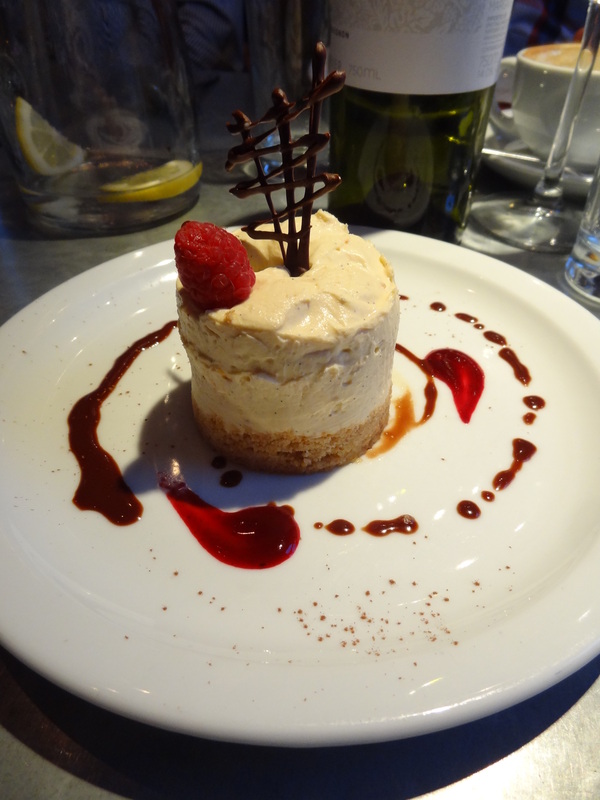 Rounding this meal off, mainly because I was physically running out of room to eat much more, I had my arm twisted to try the vanilla fudge cheesecake. Beautiful. Just beautiful. Taking the typical cheesecake topping and adding in a velvety rich fudge made the texture almost like a thick marshmallow spread. Sweet and chewy with a crunchy base. Too rich to finish after all of that but well worth the effort. Leaving was hard, not just because I was weighed down by a massive meal but it was also a fantastic experience that I didn’t want to end. I’ll certainly be back again the next time I make it across the water and this will definitely be the only refuge I need. Yang Sing appears palatial upon entering through the entrance of rich dark woods into a dining room decorated in ornate wall paper and seemingly intimidating aura. The reality couldn’t have been further from the truth. Even after turning up (fashionably) late thus forcing the staff to put an extra seat at the table, the service was nothing short of delightful. Polite but still friendly and our host for the evening Bonnie was accommodating to a level I’ve rarely seen from a restaurant, especially considering the number of people in the group. But we’ll come back to that in due course. 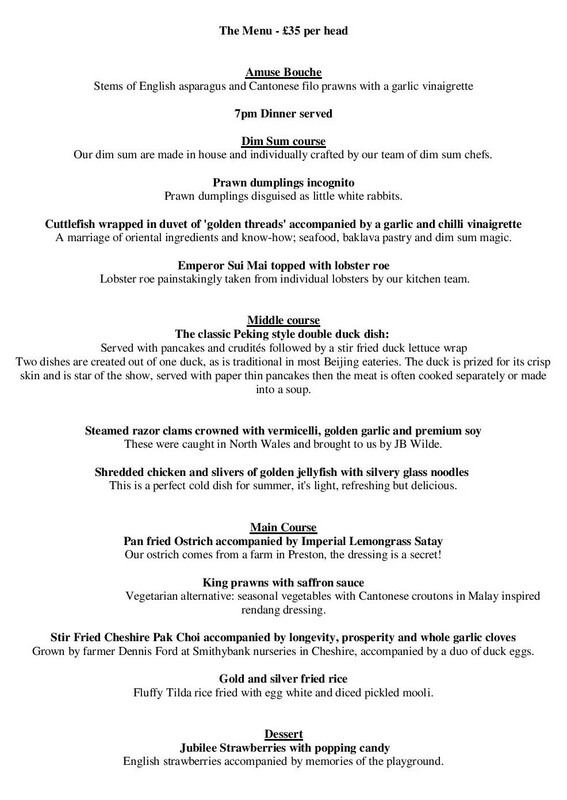 Firstly, you need an overview of this seemingly overfacing menu, so let talk about some of the highlights on offer here. 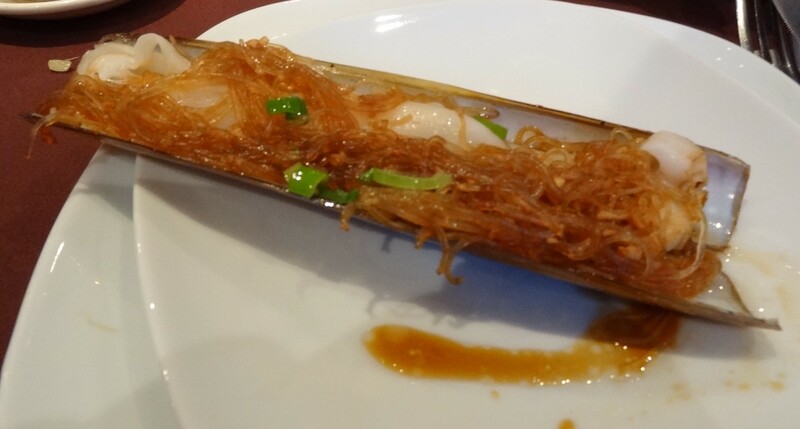 First and foremost is a great dish, the Steamed razor clams crowned with vermicelli, golden garlic and premium soy. On being presented with this dish, it looks like it’s just washed up on the beach and been scooped up onto your plate. I mean that in a good way of course; the noodles and the soy make this look like an assortment of seafood fare that’s been caught up in a razor clam in the tide. Great presentation and thankfully backed up with great flavour. The clams were excellently cooked with a good bite but soft texture. The soy adding the salt that the slightly seafood sweet clam balanced and the vermicelli giving the final substance to the dish. 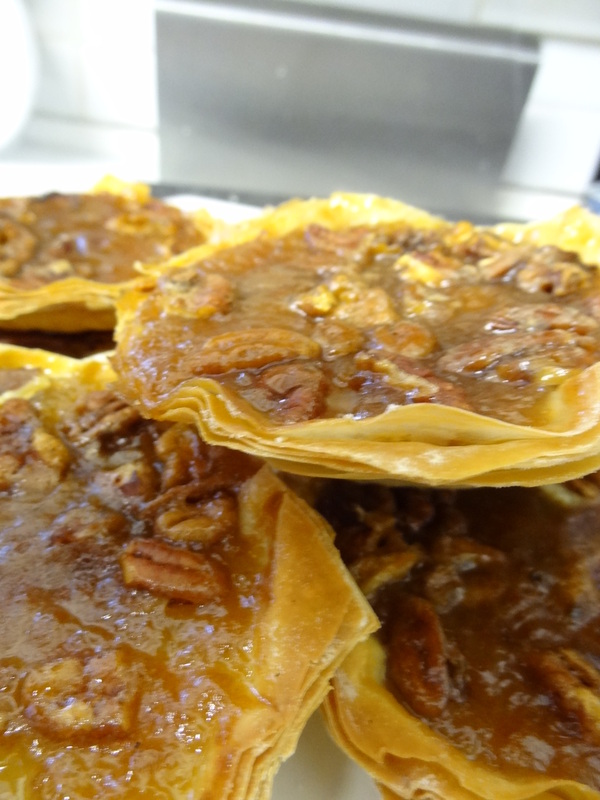 You could probably have a whole plate of these, but whose got room for that when you’ve got more dishes on the way. From the mains there were two great dishes, the King Prawns in Saffron had a wonderful flavour of fresh garden peas. Considering the vibrant colour and mildly creamy texture of the sauce this was the last flavour I would have expected which led to me spouting the sentence ‘ It tastes like peas’ with a level of amazement that might suggest that I had just discovered the taste of peas for the first time and needed to inform the others. 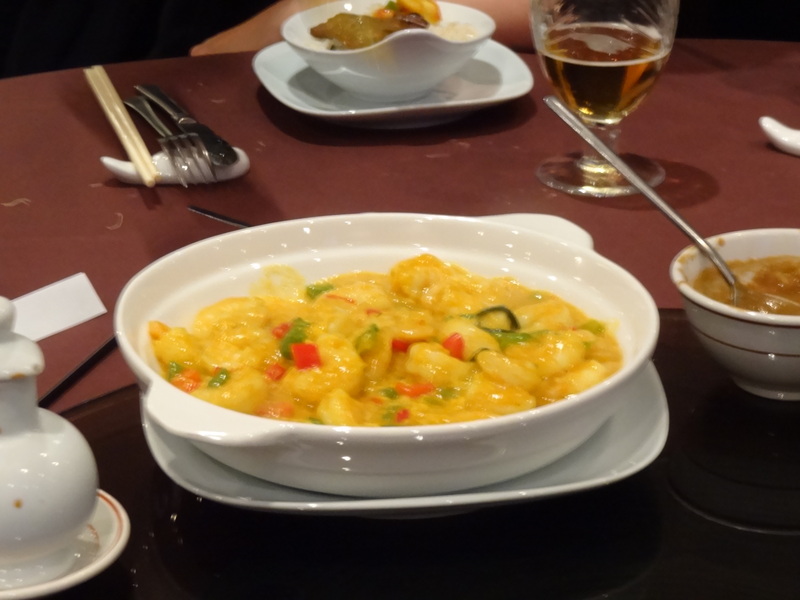 The prawns kept up their end of the deal in this dish to being plump and just the right amount of meatiness. The colour that the saffron infused into the sauce to give it a brilliant yellow without fear that you may be about to swallow a small chemistry sets worth of food colouring and e-numbers (I hope). Can you see any of the garlic in there? Trust me, its there. The Stir Fried Cheshire Pak Choi acompanied by longevity, prosperity and garlic cloves gets top marks for a poetically pleasing name but also for its taste. 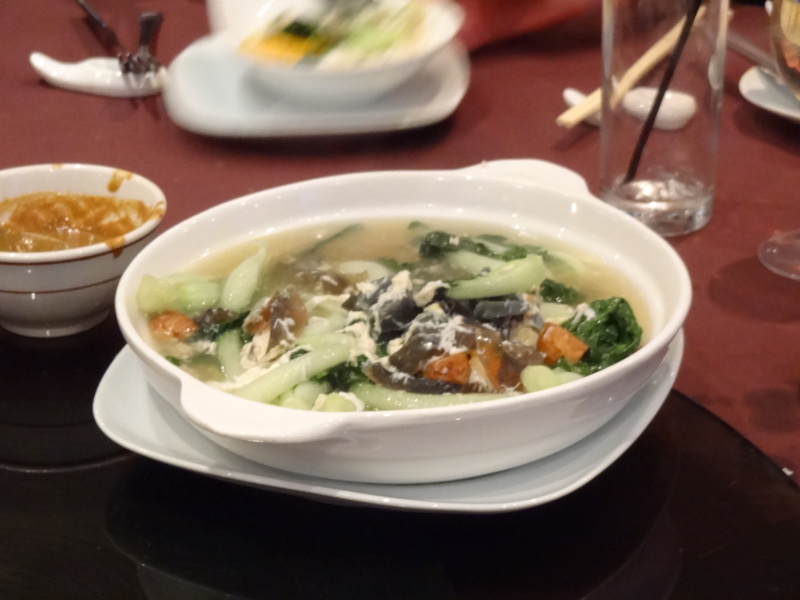 Pak Choi was crisp in a broth base with the flavour of garlic and duck eggs mildly seasoned and spiced to give this dish a refreshing quality typically only found in chinese dishes. The part I particularly enjoyed was the whole garlic cloves which had been mellowed by the broth leaving them with just the subtle undertone of garlic as you bit through them. Tjhe one dish I wouldn’t have expected to be talking about by the end of the night was the dessert. 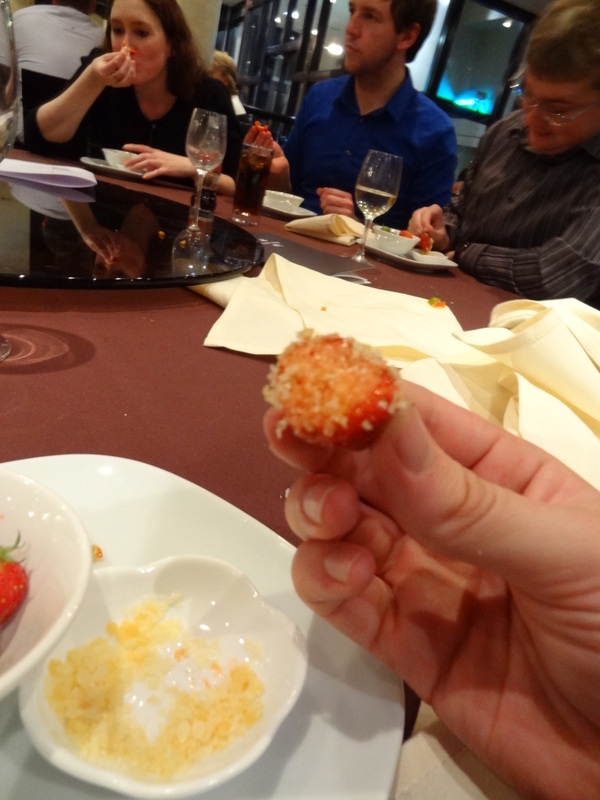 When someone says to you strawberries and popping candy, it doesn’t put you in mind of a Heston Blumenthal classic. 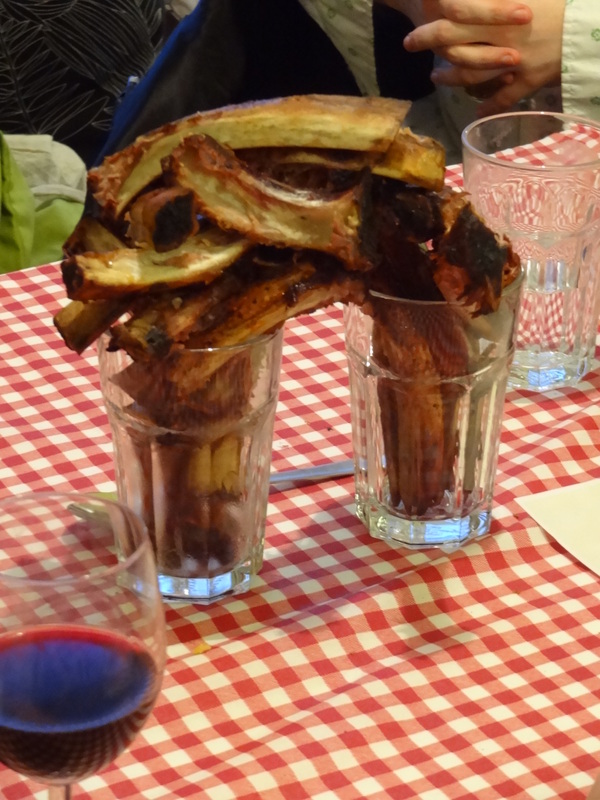 Having said that though, this dish prompted more conversation around the table than any other. The strawberries were perfectly ripe and packed with the sweet, moreish fruit juice that you hope for but never get in supermarket strawberries. The popping candy melted into the side of the soft strawberry flesh and was already partially popping before you got it in your mouth. Then you just sit back and let the popping candy do the work. The simplicity of this dessert was such a great decision at the end of this lavish meal that it felt refreshing and reinvigorated the room. Wouldn’t have traded it for any other dessert at that point. By the end of the meal, that seemingly intimidated dinning room seemed a lot cosier and a more relaxing place to be. I think that’s part of the charm to this restaurant, that beneath the imposing appearance is a warm inviting place to eat. You may even want to just drop in for some dim sum and a sit down, but should you want the full banquet experience, there’s enough here to satisfy. Fire and Salt BBQ Co.